Get ready to sport some of the coolest gadgets, perfect for upping the ante in your automobile or for showing your love for all things vehicle-related. These contraptions push the limits of technology to bring you innovative and over-the-top tools for making your day a little easier, or at least more fun. Check these out and consider adding these to your car thingamajig collection. Take those turns like a bat out of its cave thanks to the innovation a 100 percent spill-proof cup holder. This attachment works for every single make or model on the road, just as long as your car already has a conventional cup holder. Slam on your brakes, swerve into traffic or climb the highest grade hill—all without spilling a single drop of your tall latte with this magic gadget. For those who have a penchant for car themed jewelry, the Timeburner by Miki Eleta takes telling time to a faster pace. Watch the watch in action as the piston pumps with the time. Unlike any watch on the market this unconventional timepiece screams for the attention of any car enthusiast. Truly a conversational piece, the Timeburner takes telling time to a whole new gear. Peace, love and… toiletries? That seems to be the case with the VW Beetle themed toiletry case in bold orange. Featuring a soft fabric exterior and a zippered top hatch, you can store your bathroom essentials in this hip little Volkswagen Beetle shaped case. Fully detailed with windows, head lamps and tinted shading, this convertible top Beetle brings a hippie’s lifestyle full circle. Bring back your 1960’s while keeping hygienically responsible. Thanks to a fully lined interior your car will outlast your latest makeup trend. Additionally, several interior pockets help you keep your necessities in place for your next road trip adventure. As more and more cities take the green light from Amsterdam and Seattle by installing bike lanes, drivers are becoming more at risk of hitting their two-wheeled passersby. Soon this will not be an issue thanks to the innovation of a bike helmet that communicates with bicyclists and car drivers. Developed by Volvo this helmet will only communicate with Volvo owners in the beginning. This will occur via the cloud, which will send messages through the car’s notification system that there is a bicyclist oncoming. Expect this technology to expand rapidly across other automobile makers. No one likes to sit in the backseat of an older model car on a long drive. After all, the A/C or heat only blow so far. Well, thanks to this new A/C redirector called a Noggle that is modeled to look like a plush python, polka dots or camo covered tubing, your backseat riders can keep their cool. Notably in a kid-friendly shape look for this impressive gadget to be successful enough that backseat riders of all ages will be interested in purchasing. The Noggle comes in 50 feet stretches for automobiles, but you can also purchase 100 foot long Noggles to be utilized in your RV, van or SUV. The Noggle can be connected easily to other Noggles to increase your range of cooling. 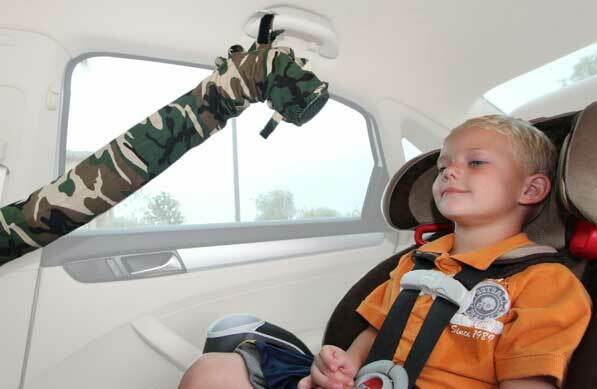 Fingers crossed that the Noggle will come in adult-friendly patterns soon for those backseat riders over the age of 10. When it comes to cool car gadgets these implements only take you so far. If you are interested in improving your driving capabilities, traffic school is the best tool for your needs. Additionally, if you want to make your driving experience safer opt for defensive driving courses as a way to earn an auto insurance discount. You can enroll in traffic schools or defensive driving courses whether or not you have been charged with a moving traffic violation. Consider adding “Enrollment in defensive driving course” to your wish list for car themed gifts from your loved ones.